We aim to keep this documentation up to date, but the Inithooks documentation source (on GitHub) should always be up to date. Before we expose a TurnKey system to a hostile Internet, we first need to initialize it. This will setup passwords, install security updates, and configure key applications settings. This initialization process can be interactive or non-interactive depending on what works best given where and how the system is deployed. All software is potentially buggy but we can minimize the risk by intentionally favoring simplicity over fancy eye candy. The boot console on first boot on build types (e.g., ISO, VM, VMDK) where the real or virtual machine usually provides access to an interactive system console. The first administration login on build types running on headless virtual machines (e.g., AWS marketplace, OpenStack, Xen). that don't provide the option to interact with the system at boot time. After boot, a virtual fence redirects attempts to access potentially vulnerable services to a web page explaining how to SSH into the machine for the first time to initialize the system. After initialization the virtual fence comes down and all services can be accessed normally. The TurnKey Hub streamlines deployment by preseeding system initialization settings with values the user provides before launching an instance through the Hub's cloud deployment web app. This means when the system boots for the first time it doesn't need to interact with the user through text dialogs. Preseeding is well documented and may be used by other hosting providers or private clouds in a similar way to streamline deployment. Stop! The preceding introduction explained everything mere mortals need to know about the system initialization process. Appliance hackers interested in learning how TurnKey works under the hood and developing their own configuration hooks. Expert users who want to understand how system initialization works in depth. Hosting providers and private cloud fullstack ninjas interested in implementing tight integration between TurnKey and custom control panels. This isn't a requirement, just a bonus. Without any special integration, TurnKey images can be deployed like any other Debian or Debian-based image, using your existing deployments scripts. If you can deploy Debian or Ubuntu it should be trivial to deploy TurnKey. Regenerate secret keys (e.g., SSH, default SSL certificate): This isn't just a good idea, it's necessary to avoid man in the middle attacks. Configure basic application settings (e.g., domain, admin email): especially useful when configuring the application would require hunting down the format of a configuration file. Also, Inithooks provides a preseeding mechanism designed to make it easy to integrate TurnKey with custom control panels provided by various virtualization solutions and cloud hosting providers. These scripts are located in two sub-directories under /usr/lib/inithooks - everyboot.d and firstboot.d. They are executed in alphanumeric ordering. This means a script named 1-foo would be executed before 2-bar, which would itself be executed before 3-foobar. That's why scripts in these directories have funny numbers at the beginning. The inithooks top-level init script is executed early on in system initialization, at runlevel 2 15. This enables configuration of the system prior to most services starting. This should be taken into consideration when developing hook scripts. If the user executes "turnkey-init" from a root shell. This command can be used to rerun the firstboot.d inithooks interactively to reconfigure the appliance if needed. Certain scripts such as those that regenerate secret keys are skipped. See BLACKLIST variable in /usr/sbin/turnkey-init for details. When the user logs in as root for the first time into a headless system. This triggers "turnkey-init" to run so that the user can interactively complete appliance initialization. inithooks checks whether or not this is the first boot by checking the value of the RUN_FIRSTBOOT flag in /etc/default/inithooks. If the value is false it runs the scripts and toggles the flag to true. The firstboot scripts may run in one of two modes, interactive or non-interactive, depending on the type of build. Interactive mode on non-headless builds - Live CD ISO, VMDK and OVF: With these image types interactive access to the virtual console during boot is expected so some of the inithooks initialization scripts will interact with the user via text dialogs the first time the system boots (e.g., ask for passwords, application settings, etc.). These are the same scripts that get executed if you run "turnkey-init". Non-interactive mode on headless builds - OpenStack, OpenVZ, OpenNode, Xen: with these image types interactive access to the virtual console during boot can not be assumed. The first boot has to be capable of running non-interactively, otherwise we risk hanging the boot while it waits for user interaction that never happens. So instead of interacting with the user the system pre-initializes application settings with dummy defaults and set all passwords to a random value. If a root password has already been set (e.g., in a pre-deployment script) the headless preseeding script will not overwrite it, so your root password should work just fine. The output from the non-interactive running of the firstboot scripts is logged to /var/log/inithooks.log. Initialization fence: the above headless preseeding hook also activates the "initialization fence" mechanism which uses iptables to redirect attempts to access the local web server to a static web page served by inithooks/bin/simplehttpd.py. This page explains you need to log in as root first in order to finish initializing the system. The purpose of the fence is used to prevent users from accessing uninitialized web applications, which in some cases can pose a security risk. After the user logs in as root and completes the initialization process the "initialization fence" is turned off. Users can then access applications running on the local web server. what command are we running in the dtach session? Scripts that are in the everyboot.d sub-directory run on every boot. We try to minimize the number of scripts that live here because they're basically a poor man's init script and real init scripts are often a better idea. On headless deployments the user needs to login as root to complete the appliance initialization process, but how do you login as root? Not a problem if you're using OpenNode or ProxMox - those systems prompt you to choose a root password before deploying a TurnKey image. On OpenStack you can log in as root with your configured SSH keypair or retrieve the random root password from the "system log". Other virtualization / private cloud solutions should be able to use their existing deployment scripts to set the root password, just like they already do with Debian and Ubuntu. Another more advanced option is to "preseed" the /etc/inithooks.conf file in the apliance's filesystem before booting it for the first time. This lets you leverage inithooks to pre-configure not just the root password but also the database and application passwords, admin email, domain name, etc. However note that using preseeding deactivates the "initilization fence". If you're using preseeding TurnKey assumes you've already interacted with the user some other way (e.g., web control panel) to get the preseeded configuration values. By default, when an appliance is run for the first time, the firstboot scripts will prompt the user interactively, through the virtual console, to choose various passwords and basic application configuration settings. Don't worry about leaving sensitive passwords in there: after the first boot, inithooks blanks /etc/inithooks.conf out so important passwords aren't accidentally left in the clear. This preseeding mechanism makes it relatively easy to integrate TurnKey with custom control panels, virtualization solutions, etc. How exactly you create /etc/inithooks.conf is up to you and the capabilities of the virtualization platform you are using. For example, many virtualization platforms provide a facility through which you can run scripts or add files to the filesystem before the first boot. Below is a list of interactive firstboot hooks. All interactive hooks have preseeding options to support cloud deployment, hosting and ISV integration. Note that almost all appliances have their own application specific secret-regeneration hooks. If not preseeded, the user will be asked interactively. The SKIP and FORCE options should be self explanatory. Note that secupdates is automatically skipped when in live demo mode. So you're creating a new appliance and want to add initialization hooks. Awesome! Here are some examples to get you going. The following example is used in the Joomla15 appliance. It regenerates the secret, and sets a random mysql password for the joomla user. 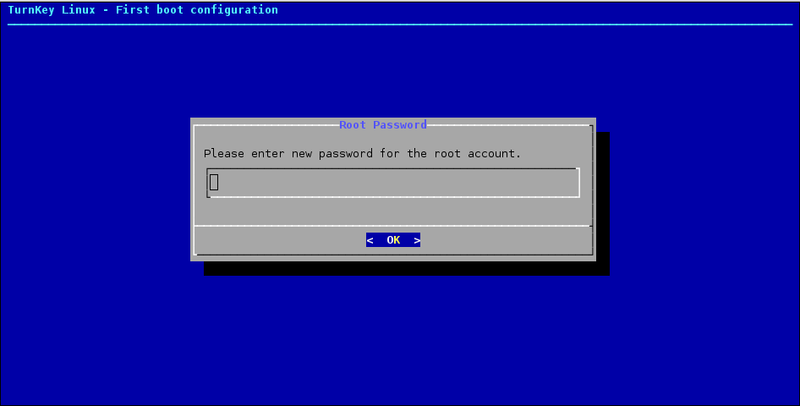 The following example is used to set the root password in all appliances. If ROOTPASS is not set, the user will be asked to enter a password interactively.